B: I began playing the piano at age 5. Helen Johnson was my first piano teacher, and she lived two streets over from us. Mrs. Johnson was a customer on Paul’s paper route. Paul came home from collecting one day and told my mom about this lady who teaches piano; my mom asked if I was interested in taking lessons and I said yes. So it began! Shortly after I began lessons, Mrs. Johnson called my mom and asked if it would be possible for her to see me for lessons every morning before school because she thought I had a talent for playing and she wanted to nurture it. That’s what we did every Monday through Friday -- piano lessons before school! I studied with Helen Johnson until I was in high school when my brothers’ clarinet teacher, Kal Opperman, recommended that I audition with Elizabeth Hagenah who taught at Boston University. I auditioned, and began studying with her. My dad would drive me to her home in Stockbridge, MA every Saturday morning for lessons. He loved that because we would stop at the Penny Candy store and then at Friendly’s every week without fail! After I graduated from high school I continued my studies with Raymond Hanson at the Hartt School of Music. S: Tell me about your work -- teaching, schools, and church -- What is a typical day/week like for you? B: I love teaching! I teach piano to about 45 students ranging in age from 5-86! I love it because every 30 minutes it’s a new story. Every student is different -- different levels, different personalities, different abilities – the variety makes my job fun and interesting. I also teach at two Catholic Schools…general music classes Pre K-8. That’s a whole different story from the private piano teaching, but still quite interesting and sometimes not as enjoyable. 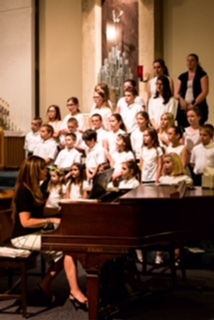 I am the Director of Music at a Catholic Church in Enfield, CT where I play at all of the Masses, direct an Adult Choir and a Children’s Choir. A typical day for me is teaching at one of the schools until 2:30, then going to my Music Office and teaching piano from 3:00 until either 7:00 or 8:00 depending on the day. On some evenings I have choir rehearsal or church meetings. For the last nine months, when I get home around 8:00 or 8:30, I practice Rachmaninoff until 10:00 or 11:00. S: What do you like most about your work? B: I think what I like most is the variety of my work. There are so many different aspects to my job -- every day is different. Honestly, it never feels like work. Of course, there are parts of my work that I like better than others but at the end of the day no matter which aspect I worked on that particular day, it’s all music, and to me, that’s awesome. Sometimes when people major in music in college, they come out with their degree and have to supplement their income with other jobs such as waitressing, office jobs, etc. I have been fortunate enough my entire adult life to do nothing other than music to make a living. The only job I had that was not music related was being a paper girl for the Hartford Courant from the time I was 7 until I graduated from high school. Am I a world famous pianist traveling the world on tour? No. But I do make music and teach music 7 days a week 52 weeks out of the year, and to me, that is success! Another thing I love about my job is when I come across a student who shares my passion and desire for music – one who knows what it takes to be good, who is willing to put in the time and effort and the hard practice to be the best that he/she can be. It’s exciting to have a student who “gets it” and loves it and wants to become better and better. S: What do you like least about your work? B: There are two things I don’t like about my job. Times are way different today than they were when my four brothers and I were growing up taking lessons. We took music lessons and that was it. We didn’t play sports or take dance and karate. We took music lessons and we practiced 2-3 hours a day. Today kids are involved in so many different activities that, unfortunately, there’s no time to practice. There are times when my students don’t touch the piano from lesson to lesson; that is sad, disappointing and frustrating for me. The second thing that bothers me is that some people don’t see my career as my job. I’ve had people come up to me and say, “You play really well. What’s your real job?” It would be nice if people understood how hard musicians work to be the best at their craft. S: What skills/personal attributes are most important to being successful? Do you feel you need to be a good business-person, as well as a master on piano? B: In my field of teaching there are many things you need to be in order to succeed. You need to be good at what you do and you need to love it! You need patience-- lots of patience. Every child is different; some more talented than others, but even so, every child needs to be given a chance and made to feel like they are doing the best that they can. I want my students to love music –not to think of it as a dreadful thing that their parents are making them do. S: There are a lot of pianists/piano teachers out there -- what separates you from the rest? B: I grew up taking lessons from a very strict teacher. She loved her students to death, but we were all scared of her. When I first started teaching I was very much like her, but as the years went by I realized that I needed to soften-up a little bit. As I said earlier, times have changed; kids don’t practice like they used to when I was young. I try to keep a balance between the strict and the loving/nurturing sides. My students know that I expect them to practice. We keep time sheets and sticker charts, and for the most part they do practice. They know that I can tell when they don’t…and when they don’t I know they are very nervous to come to me, which I like, because that shows they care and know that they haven’t lived up to my expectations. With that being said, I always tell them that I understand school work can be overwhelming and sometimes practicing has to take a back seat. I don’t want them to be afraid to come to their lesson I want them to love coming to lessons. S: CHSO has provided opportunities for you to do work outside of your teaching -- can you say a few words about that? Reflect back to your Rhapsody in Blue performance in 2005, Chamber performances with Paul, and any others that come to mind. B: Over the years I’ve had several opportunities to perform, thanks to Paul and the CHSO. Paul and I have been performing together forever --it’s awesome. I love accompanying (I love accompanying Paul) and CHSO has given me many opportunities to do so through its many different concert series. These opportunities push me to grow and continue to be better –and they get me “out there” to perform. In 2005 I performed Rhapsody in Blue with CHSO – it was the best night of my life! That was scary but so much fun. Rhapsody in Blue is just a fun piece to play. It has difficult spots but they’re nothing compared to the Rachmaninoff. The Rachmaninoff piece has certainly pushed me to my limits in a great way. S: When you were first asked about performing Rachmaninoff: Piano Concerto No. 2 with the CHSO, did you have to think about it before saying yes? B: I sure did! As a child and young adult I had many bad experiences with performing. I have a very hard time managing my nerves --they overtake me when I perform and it doesn’t always make for a great performance. I have to play a lot of mind games with myself when I perform. For that reason, I do not enjoy being in the spotlight. I had to think long and hard about whether or not I would be able to get over the nervousness so that I could make this the best performance possible. I don’t mind accompanying someone else, but to be the soloist, it’s scary. I also knew that taking this project on would involve a lot of my time with a lot of practicing and I knew that with my schedule there is not a lot of spare time to practice. Desire to do this way outweighed all of the negative thoughts I may have had and I said yes. I said yes for many reasons…first and foremost, to prove to myself once and for all that I can do this! S: Tell me about this piece and what it means to you? Is this something you've dreamed of doing? B: Like I said earlier, I started playing piano when I was 5, and my teacher would have us listen to piano performances all the time. The Rachmaninoff 2nd Piano Concerto has always been one of my most favorite pieces in the world. When I was old enough to drive and own a car that had a cassette player (my first car did) or CD player…my choice of listening was always this Concerto. When I listen to this piece it always gives me an adrenaline rush and makes me just want to get to the piano and be the best I can be. It’s filled with beauty, passion, emotion --it’s calming and exciting all at the same time. I have always dreamt of playing this piece and now my dream has come true. S: How have you been preparing for this? B: I have listened to this concerto every day since May 28th - the day Paul asked if I wanted to play it with the Symphony. I put together a game plan --a time table for learning it—I worked on it every day two pages at a time. My plan was to have it roughly learned by the end of August because I knew once I was back into the full swing of teaching and school and choir rehearsals, practice time would be limited. Once school started in September, every night was reserved for Rachmaninoff. I’ve been working on tougher sections over and over; it’s been exciting to see it improving and “owning it” as they say! S: Do you have a favorite movement -- if so which, and why? B: I can’t say that I have a favorite movement -- I love all three. The first is beautiful and exciting at the same time. The second is just so beautiful and the third is an adrenaline rush. I think that’s why I love this piece and have loved it all of my piano-playing life. There is not one second of the piece that I don’t like!!! S: What's next?? Once this performance has been completed, what do you want to do next? B: As soon as it’s over I’m going to give my hands a break. During this preparation I have developed carpal tunnel syndrome in my left hand and I want it to heal so I don’t have to have surgery. After that it’s back to accompanying for concerts. My nephew Zachary, who is a violinist and plays with the CHSO, already has a recital scheduled that he wants me to play on. S: Well, those are all of my questions. Is there anything else you’d like to share? I also want to thank my fiancé, Jim, for his continued support and encouragement during this preparation period. I think he knows this piece in his dreams by now! !